— Geoffrey Tozer, May 9, 2005. Tozer, quoted from his letter to Pamela and David Freeman after Tozer had given a Master Class featuring Jayson Gillham in Queensland. Copyright, The Estate of Geoffrey Tozer. 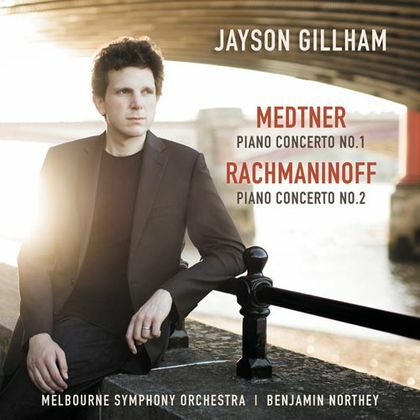 In July 2017, ABC Classics released a new recording of the brilliant young Australian pianist Jayson Gillham performing Medtner Piano Concerto No. 1 and Rachmaninoff Piano Concerto No. 2 with the Melbourne Symphony Orchestra, conducted by Benjamin Northey. In his notes for the CD, Gillham wrote that "The Idea for this album began with an invitation a couple of years ago to be involved in a documentary... about the life of Australian pianist Geoffrey Tozer (1954-2009). Tozer was one of Australia's finest pianists, a true child prodigy and musical genius." Geoffrey Tozer gave the Australian premiere performance of Medtner Piano Concerto No. 1 on September 9, 1992, at the Llewellyn Hall, Canberra, which was sold out on that occasion. Tozer had given the Australian premiere performance of Medtner Piano Concerto No. 2 (the first of four performances) in November 1982, at the Sydney Opera House. Tozer championed the music of Medtner throughout his career, in Australia and around the world. His first performance of Medtner's music was for a fundraising concert for the Hebrew University of Jerusalem, in Melbourne in 1968.